If you have a tournament very similar to a previous tournament you've run on the platform, you can copy settings from the old tournament. Copying settings from a previous tournament will save the hassle of consistently entering details that you've previously entered into smash.gg. Cloning is found within Advanced Settings on the Create a Tournament Modal. In this menu, you can choose which options are carried over to the new tournament. 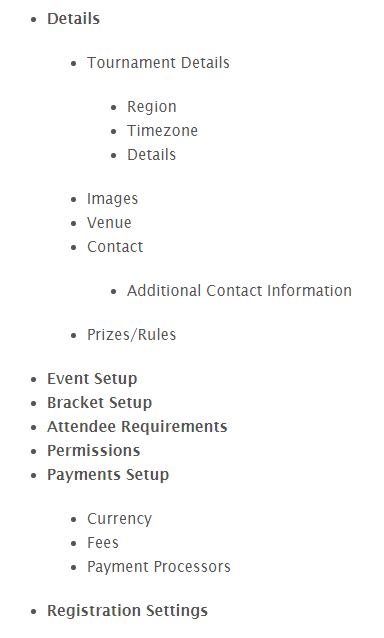 Once you've created a tournament with copied settings, you will still need to go through the Things To Do process before you can begin running your tournament. The following settings on each page are copied to your new tournament. If it is not listed below, it is not copied over. Pages in bold mean the entire page is copied over. All time related fields are relative to the new tournament start and end dates. For example, if the registration end date was set 5 days before the old tournament, the new, copied tournament will have a similar setting.